Since 2000, Captain Supertooth has crusaded across Oklahoma extolling the virtues of good dental self-care. 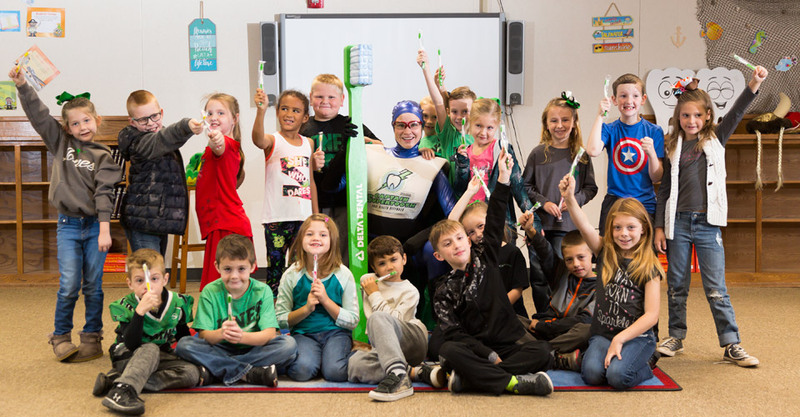 Using a giant toothbrush, fun props, and volunteers from the audience, the Captain presents a lively 30-minute program inspiring kids to be superheroes to their teeth! The Captain Supertooth Program is for all Oklahoma students in kindergarten through third grade. The Captain wishes she could go to every school every year, but our resources are limited. We appreciate your understanding as we try to reach as many Oklahoma kids as possible! Region. We attempt to fairly distribute Captain Supertooth performances throughout the state. That means there may be waiting lists in some regions and not in others. Special or At-Risk Populations. Within each region, half of the Captain Supertooth performances will be at schools or events with children who are underserved, at-risk, or in special populations. First Appearance. Preference is given to schools where Captain Supertooth has not previously visited. However, Captain Supertooth will make repeat visits to schools on a non-consecutive basis. Please read our Frequently Asked Questions page first. Then submit our online Request Form to request a visit for your school or event.